Forum: Should The Draft Be Reinstated? Staying the course in Iraq means increasing our troop strength, and, not surprisingly, recruitment and re-enlistment levels are down. But proposed enlistment bonuses and other economic incentives will not make the military any more attractive to upper-middle-class young people. Increasingly we will be a nation in which the poor fight our wars while the affluent stay home. To correct the disparity among those who serve, South Carolina Senator Fritz Hollings and I have proposed a new draft. All men and women ages 18 to 26 would be eligible for induction once they have completed high school. Those not needed in the military would perform civilian service. Enacting our plan would democratize our armed forces and return to the "citizen soldier" ideal that has served our nation so well. As a veteran, I strongly believe that fighting for our country must be fairly shared by all racial and economic groups. Nobody wants to go to war, but the burden of service cannot fall only on volunteers who, no matter how patriotic, are attracted to the military for financial reasons. We cannot continue to pretend it is fair that one segment of society makes all the sacrifices. America deploys the most powerful military on earth because its soldiers freely choose to serve. Today's military is picky. In 2003 more than 9 of 10 enlistees had a high school diploma. The military takes virtually no one who doesn't score in the top three of five categories of the Armed Forces Qualification Test. Equally important, the all-volunteer force (AVF) is staffed by soldiers who want to be there. 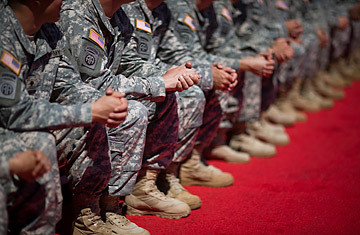 Draft advocates want "citizen soldiers." But 4 million young people turn 18 every year, while the military inducted 185,000 recruits in 2003. A system that took just 5% of those eligible would be highly arbitrary. The worst lie told by conscription advocates about the AVF is that it is an underclass military. Overrepresentation of blacks is modest; Hispanics are actually underrepresented. While there may be few sons and daughters of Wall Street in uniform, the military is an overwhelmingly middle-class force. The most obvious reason to maintain the AVF is practical: it's the best way to raise the world's finest military. What sets American society apart from totalitarian hellholes like Saddam Hussein's Iraq is its dedication to individual liberty. Conscription sacrifices the very values we are supposed to be defending. Our country is facing new kinds of threats and needs a new kind of draft. Even before the wars in Afghanistan and Iraq, our military was severely overstretched in fulfilling its missions. But more important, we have done nothing serious about homeland defense in the war against terrorism. We need guards for our nuclear power plants, dams and public facilities. We have done little to create the necessary border patrollers, customs agents and cargo-ship inspectors.